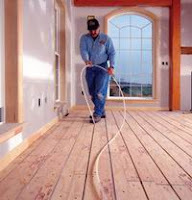 Cool Ideas: Improperly Testing Your Radiant Heat System with Water Instead of Air! Improperly Testing Your Radiant Heat System with Water Instead of Air! If you're considering radiant heat, here's a true story about Bill and Joan Hawley that you should find interesting. When I first met Bill and Joan they were absolutely exhausted because of the damage to their radiant heat system. What was supposed to be a calm and peaceful time of life was full of stress and worry. Although their story is not unique it clearly illustrates how a simple radiant heat installation error can have such drastic results. Bill and Joan were educated consumers that took a vested interest in the design and construction of their new home. They loved the look of tile and hardwoods and were thrilled to discover how a radiant heating system would keep their floors toasty warm. Yet, they failed to realize how one small radiant heat installation mistake could have such a disastrous outcome. The crew that installed the in-floor radiant heating system made a grave mistake and tested the radiant heating system with water, rather than air. For Bill and Joan, what made matters worse is that construction of the Hawley home ran a few weeks longer than projected and the radiant heating tubes that were tested with water had frozen and burst during a cold spell. So rather than coming to see the progress of their fabulous new dream home with toasty warm radiant heat, they were now dealing with broken radiant heating tubes throughout their house. Being somewhat of an expert in radiant heating, I was called upon to help. Unfortunately, the concrete was already poured and the cost to start over was astronomical. At this stage of the project, the only practical thing was to continue construction without the in-floor radiant heat. The regrettable part was that this nice couple had already paid for their in-floor radiant heat system, but would never appreciate its benefits. What happened to Bill and Joan is not that rare. Many radiant heat installers don't know the damage that can be caused by testing a radiant heat system with water, rather than air. I certainly don't want you to make the same mistake as poor Bill and Joan, so when testing your in-floor radiant heating system, your installer should pressure test the whole system, before any concrete is poured over it. This pressure test should be conducted for at least 48 hours. If it reveals a drop in air pressure, your radiant heat installer should check all joints and connections - this is where the majority of leaks will be found. However if the pressure continues to drop, all radiant heating tubes should be checked as well. Continue to retest the radiant heating system for at least another 48 hours after all leaks are identified and fixed. Larry Lang is the founder of Radiant Heating Disasters which specializes in the design and consulting of hydronic in-floor radiant heating systems. Larry is also author of Radiant Heat – What You NEED to Know BEFORE You Sign That Contract. This article may be distributed freely on your website, as long as this entire article, including links and this resource box are unchanged. Copyright 2006 Larry Lang All Rights Reserved.